Today there was another huge protest in Trafalgar Square, London, with a call to the Tory government to end austerity once and for all. 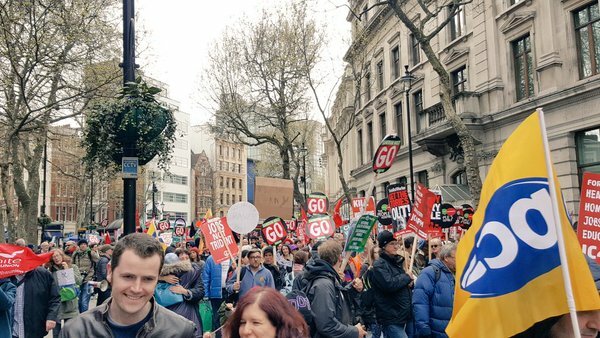 The People’s Assembly demonstration was more specifically a plea for more funding to health, homes, jobs, and education in the UK, reports RT. The People’s Assembly commented, saying that the protests are part of a ‘critical moment’ for an ‘out of touch’ government. 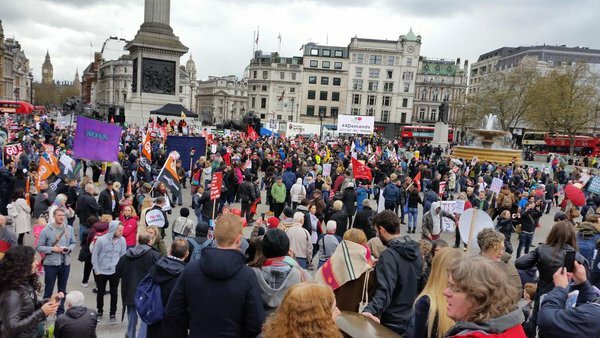 Speakers who addressed crowds in Trafalgar Square included shadow chancellor John McDonnell, Unite trade union chief Len McCluskey, as well as Green Party leader Natalie Bennett – and many more. Although the protest attracted over 50,000 demonstrators, many news outlets chose not to cover it. The four demands are also going social under the hashtag #4demands. Today’s rally follows last Saturday’s protest, which saw thousands gathered outside 10 Downing Street to demand Cameron’s resignation following the Panama Papers leak that exposed his late father’s offshore dealings. However, these protests mark just another sad day in the desperate fight against austerity hundreds of thousands believe has been brought on by the Conservative government. One part of the people rule over the rest. It’s a sad reminder for humanity when a quote scrawled out about the brutality of the ruling elite of the 1800’s is just as relevant 200 years later on.